The Topanga Coalition for Emergency Preparedness—TCEP—is a nonprofit, all-volunteer organization based in Topanga, California. For over 23 years, we've provided emergency preparedness education and real-time disaster status updates to residents of Topanga, Malibu and surrounding areas. Make your smartphone part of your Family Emergency Plan. Get TCEP tweets pushed to your phone. Put TCEP's Emergency Status Page on your home screen. Set up the PulsePoint app to receive notifications of nearby fires. Support TCEP every time you shop on Amazon.com. Simply click the link below and shop as you normally would. Amazon will donate 0.5% of the money you spend to TCEP. You don't pay any more than you would otherwise because Amazon is making the donation. Thank you for supporting TCEP by shopping at smile.Amazon.com and selecting Topanga Coalition for Emergency Preparedness as your preferred charity! Download the Topanga Disaster Survival Guide, the bible of emergency prep written by Topangans for Topangans. Can't Find Your Tactical Zone or Assigned FRS Channel? please click the orange Volunteer button. Register online or call 800-733-2767. Please note T-CEP does not post daily traffic information or accidents. It is our mission to focus on natural disasters. This was actually fire-fighting advice! * Fires were very dangerous threat to Philadelphians, so Franklin set about trying to remedy the situation. In 1736, he organized Philadelphia's Union Fire Company, the first in the city. Those who suffered fire damage to their homes often suffered irreversible economic loss. So, in 1752, Franklin helped to found the Philadelphia Contributionship for the Insurance of Houses from Loss by Fire. Those with insurance policies were not wiped out financially. The Contributionship is still in business today and is the oldest property insurance company in the country. 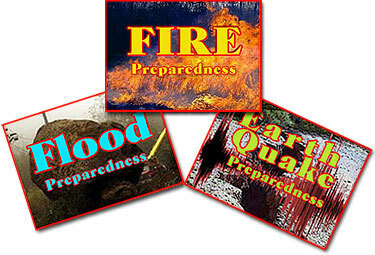 Check out our emergency preparedness supply lists and more.
" + "line2" + "